The Twentieth Sunday after Pentecost – Rev. Canon Dr. William J. Danaher Jr. In retrospect of all my years of teaching, I’ve come to the recognition that I was not an easy student to have. When I would teach at the university level and there would be a student who would challenge me as the professor, I would have this deep message inside me that would say, “It’s just payback, baby. You are getting a taste of your own medicine,” because I know that I was not an easy student. Because I was not an easy student, because I was one of those people that kind of learned in spite of myself, I remember the kind of moves that certain professors did to help me learn better. Then I had a Bible study leader who had this move that he would make because he just wanted me to read the Bible more intensively. He had this belief that somehow if I would just read the Bible a little more I would start to figure it out better and so anytime I would say something that was completely wide of the mark, he would take off his glasses and he would say, “Well that is very interesting.” The first few times I took it as a compliment, like I walked away from the bible study thinking I was interesting. He found my interpretation interesting. Then I realized when I was sitting in a Bible study and somebody said something truly outlandish and stupid and completely irrelevant and he took off his glasses and say, “How interesting,” I realized it was his technique. He was just trying to be gentle. He was just trying to get that person to hone in on really what was going on in the text. I thought about these two techniques because today we have an incredible scripture before us in which Jesus is in a confrontation with the Pharisees and there’s a saying in there that has become kind of the embedded interpretation in the Christian faith. When Jesus says, “Give to Caesar what is Caesar’s and give to God what is God’s” many, many Christians for many, many years have interpreted that to mean that you have to understand your life as being lived in two dimensions. You have the material dimension, you have the pressures of reality as we know it, and then you have the spiritual dimension. You have the life of the spirit that no one can touch. Your heart, your integrity. And so when Jesus was saying that you should give to Caesar the things that are Caesar’s and to God the things that are God’s he was trying to give us a little bit of pragmatic truth, a way of getting through the world as we know it. This teaching has become so embedded that some people argue with very good grounds that it stands behind institutions like the separation of church and state. There are certain spheres of the world, certain institutions, certain spheres that are dedicated to justice and certain spheres that are dedicated to mercy. Certain spheres that are dedicated to making sure that people pay their taxes and certain spheres that are built around generosity and mercy. Now, I have some bad news for you. I think it’s bad news because everybody I think has tended to accept this teaching of Jesus just as that is. But that interpretation is interesting. It’s very interesting and I’m afraid it’s not helpful. I think that the helpful message of today’s gospel truly is helpful and truly is important and I’m going to try my best to surface it because when certain interpretations become so embedded, it’s hard for us to imagine anything else being meant by those words. But in fact, Jesus had a very different point in mind when he said, “Give to Caesar the things that are Caesar’s and to God the things that are God’s.” Because this whole exchange happens while wolves are circling him. This happens after Jesus has come to the temple in Jerusalem to preach his last sermons and give his last teaching and then finally for Jesus, to be betrayed and mocked and crucified. This passage occurs in the context in which Jesus is going to His death. Jesus didn’t escape from the snare of the Pharisees and the Herodians with this answer. It did not give Him a way to get out of trouble. It actually was a way for Him to get into trouble. It was the final words that actually sealed His fate, that made Him an enemy of not only the political ruling elite, the Herodians, but also the religious ruling elite, the Pharisees. The key to the way in which Jesus meant this teaching is this. Jews of Jesus’s time believed that anything that bore an image on it, the figure of someone’s head, any image bearing thing, was an act of idolatry. It was an idol that you should have nothing to do with. And so when they’re in the temple, Jesus says to them, when they ask him the question, “Should we give taxes to Caesar?” and Jesus asks them for a coin. They give him a denarius, they give Jesus a coin with an image on it. Now why would they as faithful Jews be carrying a denarius? And that question is real because the coin that they should have been carrying was a shekel. And a shekel is different from a denarius in that shekels don’t have an image on them. Shekels are what faithful Jews were allowed to carry in Palestine in that time. So when Jesus says to them, “Whose image is on this coin?” He is accusing them of idolatry. When He says, “Give to Caesar what is Caesar’s,” He is suggesting that they are merely denominations of the emperor. They have been lost in idolatry. When He says, “Give to God the things that are God’s,” He’s saying that everything in this world belongs to God. Jesus was not trying to separate the material world from the spiritual world. He was not trying to separate the works of justice from the works of mercy. He was not trying to separate the works of institutions dedicated to fairness from institutions dedicated to generosity. He was in fact representing in his person, the reconciliation of God in time and place. He was about to give Himself in his person in His physical being, He was about to give Himself to God. And so in that moment, when Jesus says, “Give to God the things that are God’s,” he is offering himself and there also is an image. Because the reason why Jews refused to have images on their coins is because they believed that they were made in the image of God. That the greatest image of God was the human being who had been called into covenantal relationship with God. And Jesus Christ, Christians have come to see, is the perfect image of God in whom we are made. Our image of God is perfectly mirrored by Jesus’s image of God. In a way you can think of salvation itself as learning to have the image of Jesus pressed upon us, a little bit like a figure is pressed on a coin. So Jesus has come in today’s gospel, not to give us an interesting way to make our way in this world in which we have to live in two dimensions, Jesus has come to actually make one world out of two. Jesus has come to make our own lives and all of its messiness and all of the midst of the muddle we find ourselves in, Jesus has come to somehow demonstrate for us reconciliation in time and space. That reconciliation does involve death. But it also involves when that death is the dying of Jesus, life. That reconciliation requires a kind of walking away from idolatry. Because human beings, the scriptures say, are masterful idol makers. Idols are not only the things that we desire, like gold or coin, but idols are the things that captivate us, that fill us with fear and awe. Idols can be our children. Idols can be the ambitions we have for our lives. Idols can be the social standing we have before our friends and a community in which success and failure are well defined and narrowly defined. We can all make idols and we all do. Now the Pharisees and the Herodians found that interpretation interesting. They found it interesting because they believed at that moment Jesus was presenting Himself as the source of reconciliation and that to them seemed to be blasphemy. But you and I are invited to see our own selves in light of the fact that Jesus Christ has come into our midst seeking relationship. Completely unmediated, completely immediate, completely intimate. Jesus Christ has come into our lives in all of their complexities, and all of the sinfulness that we fall into and all of the idolatry that affects us and he has come to set us free. He has come to bring us home. He has come to redeem us, which is a wonderful economic term. Jesus has come to buy us back with His death so that we might have life. 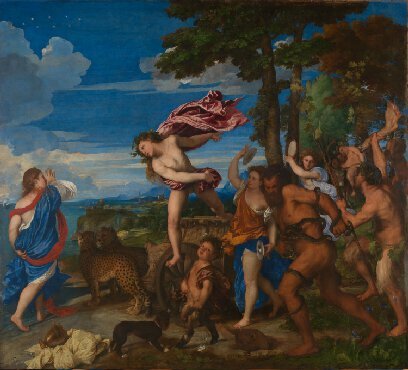 The art I have for you today is from Titian, I saw it at the national gallery in London last week. It’s one answer to the story and it’s an incredible depiction of Christ and the Pharisee having the argument over the coin. But one of the things you should know about this is that renaissance art is also full of symbolism and so there are certain symbols that Titian embedded in this piece because he wanted to communicate his answer to the question that was being presented in today’s gospel about whether he was an idolater or a worshipper of Jesus. You see this moment where Jesus is pointing up, which is a classic renaissance move, you see it in Leonardo Da Vinci’s painting of John the Baptist and basically the point of that motion is to say simply this, “As above, so below.” Titian understood that the point of this passage is not to separate things but to bring them together. Then you have this moment in which you have actually three images just as you have three images in the scriptures. You have, actually Titian was fond of painting himself. So he was the best model he knew. He might have been a little vain in this regard but he was a good looking guy, we can all agree. Jesus is in some sense the image of Titian as a young man. The Pharisee handing Him the coin is another image of Titian as an older man. Then finally there is the tiny little image on the coin and that of course is to match the images at play in today’s gospel. You have the image of the coin, you have the image of Christ and then you have the image of the person reading the text. The question we have to ask then as now is which image are we bearing on our person? Then finally there is this moment in which you have the coin coming to Jesus and the coin itself represents infinity because anything with a circle in renaissance art is meant to symbolize the meeting of heaven and earth and time and eternity. You have the artist being mimicked by the person giving the coin. The person giving the coin looks like an artist painting a picture of Jesus. That is Titian’s understanding of all that he is doing. He is not exactly someone who has fled idols, but He is someone who is trying through his own skills to find his way to Jesus. Titian presents himself as the person with the coin and in an earlier version of this painting that he did 40 years earlier, Titian actually wrote his own name on the collar of the Pharisee giving the coin because he knew how powerful idols can be and he wanted to somehow humanize this moment in which that person gives the coin to Jesus, as Jesus is gifted enough to take this image that he gives him and to rework it with grace. All of this is Titian’s moment of giving of himself to God. The giving of all that he is as an artist in the sake of this, the moment of this commission for Philip II of Spain. He saw in this painting his opportunity to bear witness to the God who has claimed him and set him free. How might you be set free? If you were an artist, what scene would you paint? What would be your coin? What image would be on your life? These are the questions you and I have to ask ourselves this day and always. Amen.